Need some time away from the children? Bring them to us! 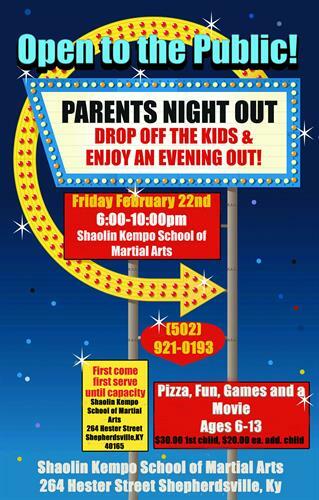 At Shaolin Kempo School of Martial Arts Parent's Night Out, you can have an evening to yourself knowing your children are in a safe and family friendly environment. Open to the public for ages 6 throuhg 13. While you are away your children will be having fun enjoying our activities, games, dinner and a movie. Drop off the children at 6pm and pick them up at 10pm.